So, Adam and Kaden are learning Latin. And I'm not teaching them. Which is best, because I don't know much Latin at all. They're learning Italian too. Once again, I'm not teaching them. Again, that's best, because I don't know much Italian at all. They considered learning Pirate too. Hey, I know Pirate (How does a pirate say "thank you?" "It's about time."). Ok, maybe not so much, but I do know a pirate's favorite letter is "rrrr...". At Mango Languages, a completely online language learning course, the boys, Adam (12) and Kaden (10) were asked to review the Mango Homeschool Edition, the boys had a choice of 72 different languages to learn, including English for non-English speakers. I chose Latin, among other things it's a great foundation for learning other Romance languages and is helpful for developing a greater understanding of English vocabulary and grammar. They've picked up a fair amount of Spanish over the years and I wanted them to try something different, so Latin received the most votes (I get 3 votes, they each get 1 ... perfect formula). 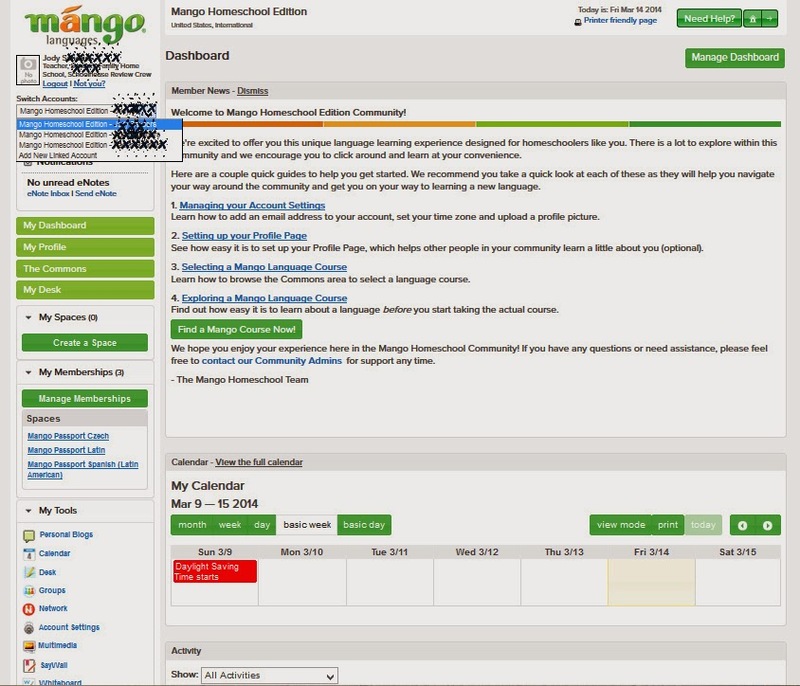 Initially, I was frustrated with Mango Languages sign-in and dashboard areas. It was not easy for me to maneuver the site and I had a tough time getting started. There are a few, short, very helpful videos that guide the parent and students through the set-up process. The videos were very handy and did make a difference, but still I was lost on their website. Adam and Kaden stepped in and, with the help of the videos, we figured out how to register them for the classes they were interested in. Each boy was given his own individual account. Students are given a choice of languages to take and could have taken any of the 72 (yes, seriously, currently there are 72!) offered. Even though Adam and Kaden are in the same "home school" they did not have to take the same language, nor are they limited to just one language. My account, separate from theirs, allowed me to take a language class as well, which I'm hoping to do soon, and gave me access to both of their accounts to oversee their progress. Once the boys were assigned to their Latin class and I had my account set up they were able to enter their class. To test the waters of the program I joined a Spanish class, upon entering the class I was able to take a placement test to determine my starting point. A placement test didn't seem to be offered for some other languages I looked at, like Czech and Latin, but I really feel like it's ok for students to start these courses in the beginning, even if they have some experience with the language of choice. They are conversational courses and the language is very broad and varied, I think even a more experienced foreign language speaker could learn by starting at the beginning. The lessons are taught conversationally, but with grammar included. We have not come across memorizing of all the forms of a verb (my middle and high school Spanish memories! ), but instead the boys learn the various forms of words as they came across them, and then use them in conversation. For the first lesson, shown in the image above, the student learns to read the first part of Caesar's Gallic Wars. The passages are broken down into sentences and then into words. Mixed into the lessons are cultural and grammar notes, giving more information. The student is able to listen to words and phrases as often as necessary by clicking on a "speaker" icon, and can use a microphone to speak and compare their speech with the narrator. While I found the initial stages of getting set up the program to be confusing, as mentioned above, the lessons themselves were not confusing at all. Everything needed could easily be found on one page, including links to other lessons and chapters, arrows to move forward and backward between lesson "pages", and a scroll bar to go through the lesson at your own pace. The boys had absolutely no problems maneuvering the lesson area and never needed assistance getting around the course. The style of the lessons was not something I'd come across before. When I learned Spanish the first conversations I was taught centered around memorizing (more memorizing) simple "hello" and "how are you" and "what's your name?" dialogues, not immersing the student in complete sentences and phrases about stories and writings and history. However, as odd as some of what I was hearing across the table sounded, and some of it sounded very odd, the kids were learning. They didn't retain every word, but they did pick up the verbs and verb forms and many of the nouns and their forms. They seemed to be grasping the flow of the language. Even River was spouting out little bits of Latin. For the last two weeks of the review I told the boys to pick a different language, anything but Pirate (I'm all for learning Pirate, but suggested that they work on that one in their free time). Both boys opted for Italian, which they've really enjoyed and have picked up pretty quickly. I think having some Spanish in the back of their brains is helping with the Italian, as is being familiar with the Mango Languages approach from learning Latin. Interestingly, while I told them they could switch to Italian they've stuck with the Latin as well and both boys are learning both languages. From Adam (12): I liked Mango Languages because I got to start two languages and I learned a lot in each of them. I like that you can learn as many languages as you want. From Ian (10): It is fun. I like the courses, I'm doing Italian and Latin. Mango Homeschool Edition is designed for ages six to adult. The lessons are spoken as well as written, perfect for a younger child who isn't a strong reader yet, but are not the least bit "childlike" and are quite challenging. The version of the program given to me and the boys to review was a "beta" version, with many neat upgrades and improvements in the works. Quizzes and tests, as well as a tracking system for both, are in the works and should be available in the next few months.